Even a small problem with your horse's digestive system can lead to big problems with his health. Bloating is rarely harmless in horses and tends to be a symptom of a larger health problem. If you notice your horse is bloated, you need to call your veterinarian immediately because the situation could be very serious and likely requires immediate veterinary care. In most cases, bloating is the result of some type of colic or an indicator that your horse may be on the verge of colicking. Colic is a catch-all diagnosis for an assortment of stomach troubles that can include problems with the large intestine, the small intestine or the stomach itself. When a horse colics, the situation can range anywhere from excess gas in the stomach or a minor obstruction to a serious blockage or a twist of the intestines that may need surgery to clear. Colic can be fatal, so it's important to have your veterinarian treat the condition as soon as you notice bloating or other signs of colic. It can be difficult to tell a horse is bloated if you're not used to looking at that horse every day. A bloated horse appears fuller throughout the stomach and the flanks than he normally does. If you attempt to saddle a bloated horse, you may have difficulty getting the girth as tight as usual. If you suspect your horse might be bloated, pay attention to whether he seems to be passing gas more than usual and whether or not he's using the bathroom. 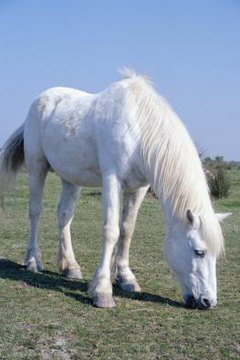 A bloated horse who is not using the bathroom, is standing with his tail slightly elevated, has diarrhea or appears to be in pain needs veterinary care as soon as possible. Bloating is typically caused when a horse eats or drinks too much, filling the stomach with more than can pass comfortably through the digestive system. Your horse may also bloat when he's suffering from a blocked or twisted intestine that will not allow food to pass through his digestive system. When these conditions occur, the food in your horse's system has nowhere to go, and your horse will bloat because he cannot pass what is currently in his body. Your veterinarian needs to determine the most effective way to treat your horse's digestive problems and reduce the amount of bloating. Medications, such as banamine, may be given to help encourage the digestive system to pass blockages and begin working again. Walking the horse and limiting his intake of food and water (if he even wants to eat) may also help the condition. In severe colic cases, surgery may be required to correct the problem. After the condition has cleared, your veterinarian may suggest making dietary changes to prevent a reoccurrence.